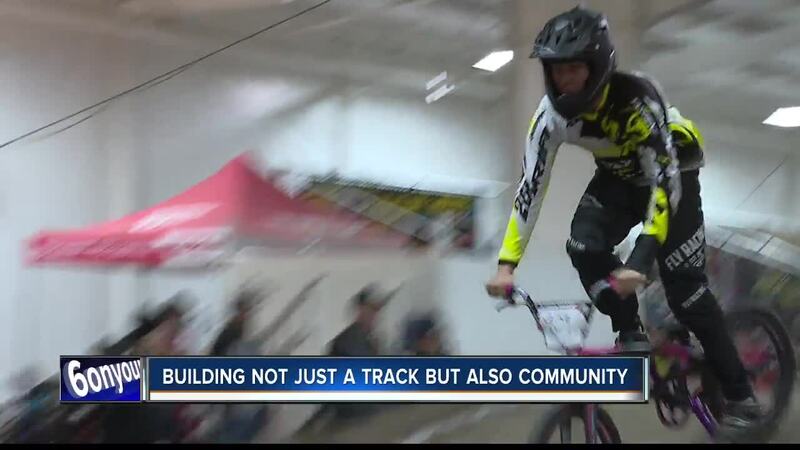 Indoor BMX racing has returned to the Treasure Valley for the first time in 20 years, giving riders a chance to compete during winter months. "Idaho Indoor BMX" has to build the track at the Caldwell fairgrounds, then tear it down and rebuild in order to make it happen. Riders say there's no doubt BMX is a family sport, and it develops friendships. This is the first time young riders Ellie and Celeste have been able to race inside in the Treasure Valley. "It's really cool we have been waiting for this for a while and since we finally got it it is really good," Ellie said. This opportunity didn't come without a lot of work. Over a two day span, Idaho Indoor BMX built a track with the help of donated equipment, supplies, and around 20 volunteers put it together. When all the racing is over, all the dirt will have to go right back out of the building, but riders say the effort builds more than just a track. "It kind of brings the family together and sometimes we got busy outside but when we come here it brings us all together and yeah," said Ellie and Celeste. Walz wanted to thank Simplot Growers Solutions who donated 1800 cubic yards of dirt, Lurre Construction out of Caldwell and Coastline Equipment who provided John Deere machinery to make the track. Walz said they are always looking for more partners and volunteers in an effort to host more BMX races during the winter, the race series will continue on March 1, the Gold Cup happens the following weekend. To see how BMX racing is all about family check out the video.